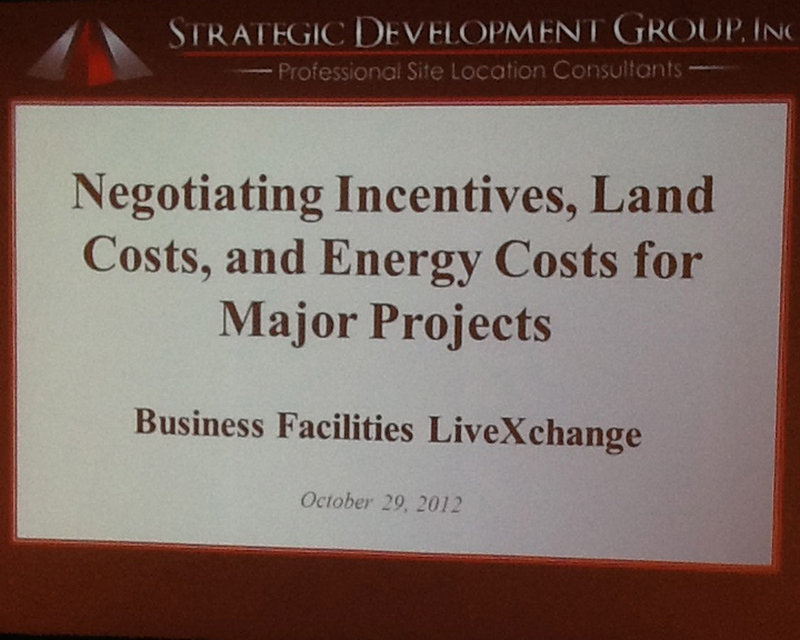 I had the opportunity to speak at the Business Facilities LiveXchange conference this week. For those of you unfamiliar with the program, LiveXchange is a novel annual business to business event that connects senior level corporate executives actively searching for new locations for their relocation. expansion, or consolidation projects with leading economic development professionals from across the U.S.. Ted Coene, President/Executive Publisher Business Facilities LiveXchange/Business Facilities Magazine positions the event as a unique way of streamlining the site selection process. I was thrilled to be invited to speak. It provided me an opportunity to share the Xavier University American Dream Composite Index work and the use of this metric to evaluate economic development organization performance. I am including some bullet points from my presentation in this post to whet your appetite to learn more about the ADCI. I hope you enjoy this post and ideally find my notes helpful to your professional learning journey. Video of the presentations will be available at the www.businessfacilities.com website in about 2-weeks. 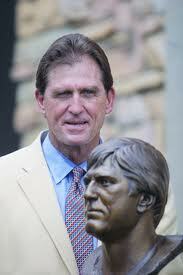 Jack Youngblood, former defensive captain of the LA Rams, 5-time All Pro and 7-time All NFC player. Jack talked about his experience as a professional athlete. Observation about economic development – If you write a big enough check, people will come. Money was the key to moving the franchise from Anaheim to St. Louis. You need to be fully engaged when the challenge is the most difficult. Do not side line yourself. Stay in the game and strive to win. You need to find what you are good at and fully commit to it. You need to have the right infrastructure to attract businesses. You need to offer something better than the competition. You need to provide expansion opportunity to accommodate success. It is important to have a personal moral compass to guide your decisions. Strategic Development Group focuses on site search and negotiation for large corporations (70% of business), strategic planning for EDOs (30%). Decision has a core team that has hired a consultant and has functional representatives (eg engineering, finance) involved in the project providing perspective. The inputs are important o the process. Short list is typically 2-3 sites that meet the basic criteria. Try to never go in with only 1 option because the client wants choice. Important considerations include site readiness, logistics, workforce (quality, availability), the financial case. National databases are important, but interviews of local businesses provide extremely important insight. Mixed reviews on designated shovel ready status because it doesn’t really eliminate work in the evaluation process. Clients need to see both an immediate workforce ( typically already employed) and a pipeline of people they can hire 5-10 years in the future. This is becoming a key differentiating point between locations. Painting a picture of unconstrained expansion is important. Companies are looking a grade school data to assess if workforce will be a challenge. Top 4 factors in the decision process are labor costs, state and local incentives, highway accessibility, and availability of skilled labor. Incentives primarily provide a psychological role. Companies want a win:win situation. Incentives are bad when they drive a company to go somewhere they shouldn’t. Company executives tend to see incentives as communities putting skin the game. It is important to understand a client’s decision factors. NPV is an important consideration. Opportunity for EDOs to value non-tangible assets (eg partnerships, health care costs). It is important to appreciate that “feel” is important. When you have a large number of potential sites you look for reasons to eliminate options. The true value of incentives are what is important. There are a lot of incentives that companies end up not being able to use the incentive. A memorandum of understanding is important to the process. Political transitions represent risk that the deal of one Administration may not be honored by the new Administration. Baseline data is important, but often challenging for a client to provide. The presentation was given by Jay Amer, President of Amer & Associates Economic Development and Past President of Economic Developers Association of Canada. Jay looked at Canada as a location for and source of expansion. Jay works closely with a broad network of regional, provincial, government and business partners to secure and develop investment and trade across Canada. Only China is a larger trading partner with the US than Canada. There are roughly 30 million cross border trips per year between Canada and the US. Employment growth is significantly better in Canada than the US. Canada is considered as one of the beast places to do business. (Economist Intelligence Unit assessment). Property cost and tax abatement incentives are illegal in many Canadian jurisdictions. Generous R&D tax credit available in Canada. The US is Canada’s largest source of foreign direct investment. More and more quality of life is becoming important in deal making. Canada is a world leader in tax competitiveness. Aerospace, agriculture-food, automotive, back office, biotech are top sectors in Canada. 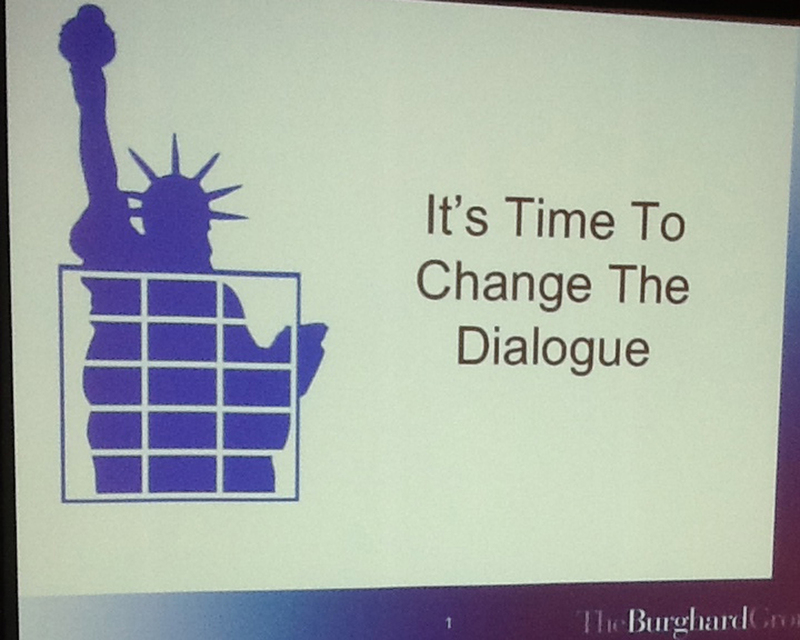 Ed Burghard, CEO, The Burghard Group. I shared data from Xavier University’s American Dream Composite Index and discussed how to effectively brand a community. Brand America’s promise is losing authenticity. 61% believe the American Dream is becoming unattainable. 31% think the American Dream is dead. 42% don’t think their generation believes in the American Dream. A declining standard of living and the failure of our leaders and institutions are seen as the biggest current obstacles to the American Dream. A majority now believe it will be much harder for the next generation to achoeve the American Dream. Education and a declining appreciation for core values lead as the greatest obstacles for the next generation. More people define the American Dream in terms of family. Nearly 2/3rds now believe the American Dream is in decline. It’s not just about jobs. It is about economic prosperity, well-being, diversity, society, and the environment. The American Dream Composite Index is a measure of the degree to which the American Dream is being realized. It is the new standard of performance for economic development organizations and elected officials. The goal for economic development strategic planning should be to increase the degree to which the American Dream being realized by people living in the community. A brand is a promise. It is not a logo and tagline. It sets an expectation of what will be experienced if a business were to locate, stay or expand in your community. Great promises are relevant, authentic and competitive. A community’s image is the perception of it’s promise. A community’s identity is what it is striving to become. Every community needs a 10 – 15 year strategic plan to bridge the gap between its image and desired identity. Branding is proactively working across a complex delivery system to ensure the community’s promise is realized each and every time. If your community’s promise is not competitive, fix it before investing in branding. Don’t invest in trying to “paint the pig”. 4-W Branding model – 1) Define who you want to talk to, 2) Determine what you want to say, 3) Identify when to say it in the decision process, and 4) figure out where to say it so your message will be heard. First Moment – The opportunity to compete. Second Moment – The competition. Third Moment – The repeat investment. The presentation was given by Dean Barber, President/CEO of Barber Business Advisors, LLC. Dean gave a look at the decision requirements through the eyes of the company. Dean has worked with Fortune 500 and international companies providing site selection analyses, incentive negotiations and tartup transitions. The first strategic question you need to ask about any expansion is – Is this a good idea? What is the business need? What is the justification for building the facility? This is serious stuff. If you choose wrong it can be costly and haunt you for years. There is no perfect place, but there are better places. The goal is to minimize your risks whenever possible. Due diligence is key to risk minimization. All options should be considered in your current location before venturing out. But sometimes it makes sense to locate elsewhere for a number of reasons. But, know those reasons. Know your options. If everybody is thinking alike, then nobody is thinking. It is important to know what you want. Write it down. Differentiate between wants and needs. Set clear goals. There are preliminary costs you need to address like relocation of equipment, furniture, people, recruiting and hiring, real estate, site prep, construction, financing, inventory build-up, etc. You need to align on a structure for how the site selection decision will be made. A good consultant should save you time, mitigate risk, understand your need, identify good locations, negotiate incentives, be a liaison. 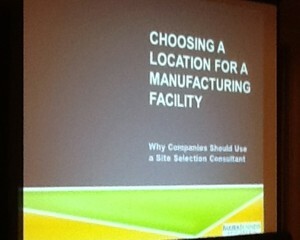 Companies can do site selection alone. But, if you’ve not done it often enough you probably won’t do it well. A senior executive may only be involved once in a site selection decision process. Defining choice drivers is key to success. Utilities and cost of energy are becoming an increasingly important. When a company needs a plant, it needed it 6-months ago. Regulations and permit delays can destroy the financials on a project. Invest in your community’s future. The presentation was given by Anatalio Ubalde, Co-Founder & CEO, GIS Planning Inc., ZoomProspector.com, & SizeUp. His company’s strategies are implemented in 39 states and serve the majority of the 50 largest cities in the United States. 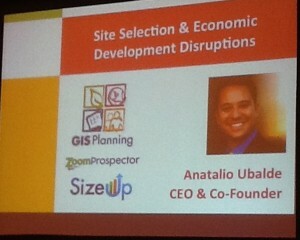 Anatalio’s talk covered key trends affecting the site selection process, economic development, and business. What we used to do is not working the way it used to. What got you to where you are will not get you to where you want to be. The problem is what you believe is true is actually wrong. Big data leads to Big answers. But we often don’t believe the data and fail to act. The amount of data is doubling every 2-years. Whittaker Associates lead qualification process is a good descriptive model. They have a tool that lets you identify potential leads that you are connected to through LinkedIn. Economic gardening is a great toll to help entrepreneurs grow. SizeUp is a tool that lets you compare your company versus competition using data from a database. Talent attraction is another big trend. Michael Porter talks about local industries and traded industries. Variation in talent largely explains the variances in economic performance. The emerging model is to focus on talent attraction preferentially to business attraction. Talent rich communities do not need to use large incentives to attract companies. Talented professionals are seeking location first, and jobs second. This has important implications on rural economic development. Ways of meeting skilled labor needs – rely on next generation, outsource, use immigrants, retrain. Local businesses contribute more to your economy than chain businesses. Small businesses require less incentives and that is good for communities. Site selectors and EDOs have different targets. 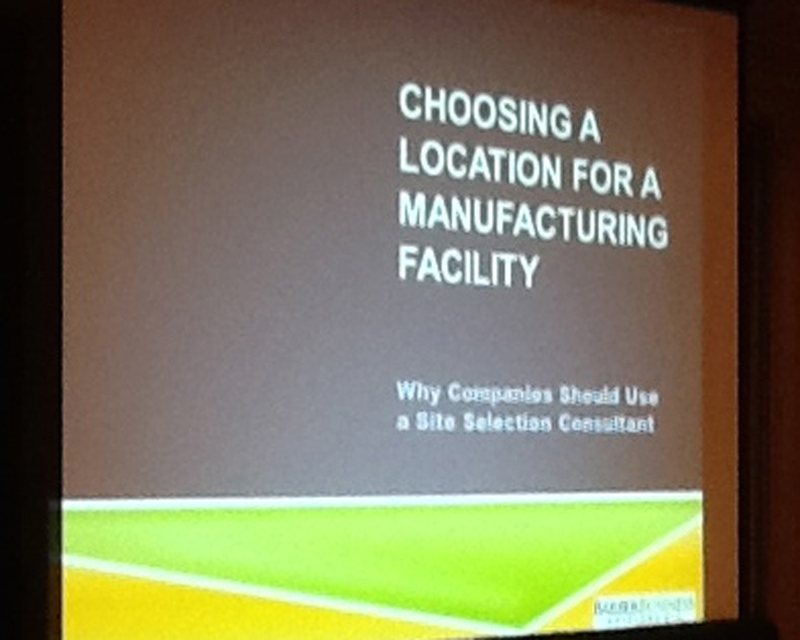 Site selectors are more focused on HQs, traditional manufacturing and distribution centers. EDOs are more focused on manufacturing, aerospace and biomed. A lot of research is happening online and communities are being eliminated before thy even know they are being evaluated. There is a decrease in human contact throughout the process. The Internet is a primary tool. There are 750,000 businesses that need a new facility each year. Communities miss a lot of opportunities because they are not visible to the research efforts of many of these companies. Change comes fast. We are trying to prepare our communities for he future when we can’t reliably predict the economy. This is a major challenge. Skilled jobs and innovation are being created all around h world. For the Millennial generation the only reality they know is an economy with significant unemployment. The implications of this paradigm will be dramatic. The current system of economic development was designed for a different era. We are trying to meet the future by doing what made us successful in the past. We need to look outside of economic development for success models and reapply them to be more effective. Looking only inside the profession for best practices will not be sufficient for success. If you don’t care about your survival, just keep doing what you are doing. You need to be able to discern the signal from the noise in order to succeed. George Tobjy, Managing Director, KPMG Global Location and Expansion Services. George has more than 25 years experience assisting foreign and domestic companies with site selection, tax and financial analyses, import and export trade issues, and negotiating relocation and expansion incentive packages. 2012 is the 9th edition published by KPMG, represents 14 countries, 87 Canadian and US cities, 19 industries. Study focuses on business cost, cost of living, quality of life and business environment. Helpful to assess overall competitiveness. Overall the US is under performing BRIC and several EU countries from a cost of doing business. India and China look very attractive for a number of industries. Processing functions tend to be moved to lower cost markets. One reason for optimism is that energy cost is a key reason for manufacturing returning to the US. Labor cost differences are a big driver of cost. The US is competitive on real estate an facilities costs. The US need to compete on sustained quality to offset some of the lack of overall cost competitiveness. Canada is highly competitive on corporate tax. I was pleased to see Cincinnati and Cleveland did well on the cost ranking. The database can be accessed to study cost by city or state to produce comparisons <www.competitivealternatives.com>. If you found value in the notes, please leave a comment. Thanks Ed, your synopsis and bullet points from the Live Xchange were most helpful. Business Facilities puts on a great event and makes things happen. Keep it coming as things change so quickly one must take a moment to rethink our positions and objectives.